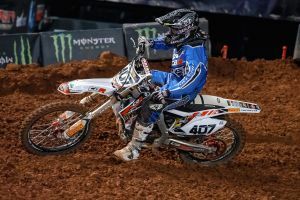 Adam Chatfield leads the Honda Arenacross challenge into the second half of the series, having recovered from injury to take victory at Birmingham's LG Arena. The 2013 champion crashed out hard in Belfast, with cracked ribs and a chest injury leaving Chatfield contemplating missing the rest of the tour. However, a quick recovery and last minute decision to race wowed the crowds in Birmingham, with Chatfield edging out French rider, Florent Richier and passing Thomas Ramette on the way to a dramatic Pro Main Event win. "Adam desperately wants his title back and showed his intent in that Birmingham performance. I know he raced through the pain barrier and he's put himself back in contention, with four rounds still remaining." In the Rookies, Olli Osmaston, took maximum points again for Honda, extending his lead over nearest rival, Johnjoe Wright to 21 points. Arenacross heads to Newcastle's Metro Radio Arena on Sunday 1 February, for round 5 of 8.